Watch a pre-alpha gameplay trailer of a goose being naughty. We last heard from indie studio House House when they released Push Me Pull You, a local multiplayer game where each player controlled one head of a wriggling, two-headed worm person. Their next project, currently called "Untitled Goose Game", is looking strange in its own way. They explain it thusly: "It's a lovely weekday morning in the village and you are a horrible goose." 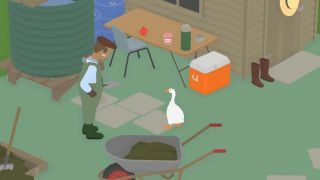 A video of pre-alpha gameplay shows said goose pestering a groundskeeper while accomplishing tasks written down in a handy list like "get the groundskeeper wet" and "rake in the lake". Who is writing down these tasks? We'll have to wait and see. At the moment it looks almost like a stealth game, with the goose sneaking around to steal keys and tools, hiding in a bush, and pressing X to honk. Then the goose waddles away with a delightful swagger. Untitled Goose Game will apparently be out in 2018. Can't wait.